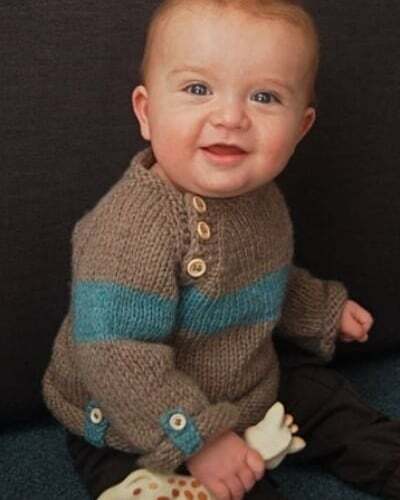 An easy top-down unisex sweater with handy roll-up tabs for tiny explorers. This sweater is completely seamless and has minimal finishing. To fit chest: 18 (19, 19.5, 20, 20.5, 21) inches or 46 (48, 49.5, 51, 52, 53) cm. Finished sweater chest circumferences: 19.5 (20.5, 21, 22, 23, 23) inches or 49.5 (52, 53, 56, 58.5, 58.5) cm. US 8 / 5mm needles (I used double-pointed needles but any needles will work).